Alex (Ewan McGregor), David (Christopher Eccleston), and Juliet (Kerry Fox) were looking for a new roommate. Each interview was like a cruel audition in which they mocked, teased, and insulted the person in front of them for whatever they deemed wasn’t worthy of their level of cool. It was established that the trio were far from likable people. Eventually, they decided to take on Hugo (Keith Allen) as their new roommate. On his first day, however, his flatmates found him dead in his bed and right underneath was a suitcase full of cash. Written by John Hodge, “Shallow Grave” was quite sly as it slithered from buddy comedy to paranoid thriller and back. It was fascinating because it magnified the common darkness found in so-called normal people and how that darkness evolved into something much more sinister when a whole lot of free money entered the equation. In one of the most involving sequences in the film, the three friends decided to get rid of the body. As to how, Alex suggested that they cut off Hugo’s hands and feet, pull out all of his teeth, and beat his face to a pulp until it was no longer recognizable. Only then they could bury the corpse in the forest for quick decomposition. His proposal, although morbid, had a certain level of comedy and wit behind it because we were shown several times that one of Alex’ hobbies involved spending ample time in front of the television. Perhaps he learned from watching too many crime movies. I liked that the important decisions that the characters made were loyal to how they were when they just relaxed in the couch. I was able to follow the story, even when it turned somewhat unbelievable, because I enjoyed connecting the seemingly unrelated pieces that had been laid out for us. After getting rid of the body, we saw how each roommate reacted to the terrible crime they’d committed. The most interesting reaction was David’s because I suspect it would be the most typical. Each day, he turned that much more paranoid, feeling that someone knew something about what he’d done and people were out to expose his secret. I feared his instability but felt sad for him at the same time because he traded his peace of mind for money–money that he couldn’t even find the courage to spend. It was deliciously ironic that he was an accountant. There were subplots involving a perceptive detective (Ken Stott) who sensed something didn’t feel right after he’d spoken to the roommates and two crooks looking for Hugo’s money. The latter was handled in an expediently hilarious and unexpected manner while the former was like watching a cube of butter slowly melting on a moderately hot stack of pancakes. Because the two strands offered an opposite atmosphere while still maintaining a level of tension that felt right to the story, it was easy to buy into the plot conveniences. However, I wish the script bothered to consider some questions that were quite obvious. Why didn’t the three flatmates simply hide the suitcase in one of their rooms after they found it and phoned the cops about the dead body afterwards? And, once they felt they were in the clear, why didn’t they divide the money into three? Personally, I would want my share as soon as possible. 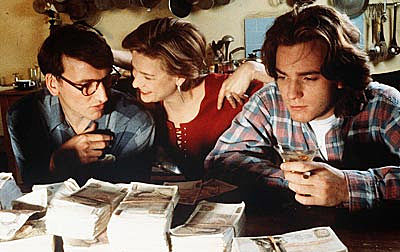 “Shallow Grave,” directed by Danny Boyle, commanded an air of seriousness when it came to guilt, greed, and morals but it wasn’t afraid to go for the humor even if it felt inappropriate. I even had a slight giggle when Hugo’s corpse was being cut with a hacksaw so strenuously by one of the trio.